Weekend breakfasts tend to be oatmeal or the hot cereal Carole and David gave me for my birthday. I eat dry cereal during the week. It's just faster and more filling. If I would organize the oatmeal the night before, I could have oatmeal, but that lends itself to more leisurely eating than I have the time for during the week. Weekends, I like to get inventive with breakfast. I have time and desire. Saturday, I had hot cereal but Sunday, being Easter, perhaps put me in the mood for something more. I thought about pancakes. I really wanted chocolate chip pancakes, but the search for a recipe didn't yield anything. I stumbled upon something I hadn't made in years, a puff pancake. It is, essentially, crepe batter poured into a cast iron skillet and the whole thing baked in the oven for about 20-25 minutes. 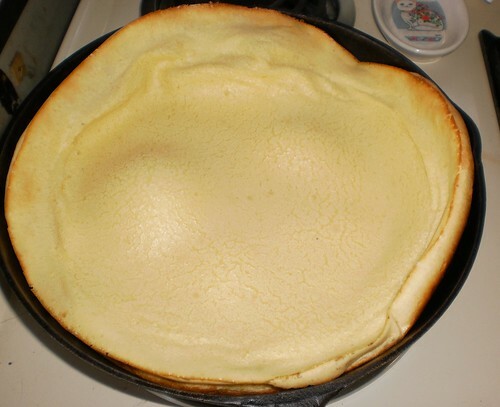 The batter puffs up, hence the name, before deflating to a skillet-size dense pancake. This recipe has instructions to make applesauce with it. I had the applesauce in the cupboard so I just made the pancake part. It's a bit sweeter than another recipe I have. Once the pancake was baking, I decided I needed muffins. I haven't felt like baking much because it's been painful to stir batter, with the twisting motion of my wrists. But, one of the benefits of medication is the reduction of the pain. 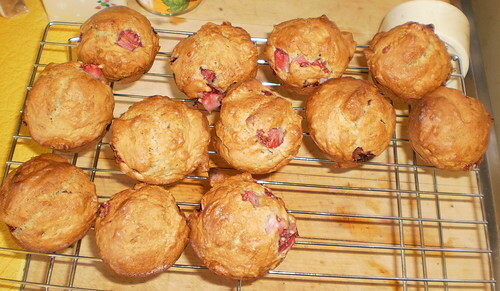 So, I got out the strawberries I bought for this occasion and made fresh strawberry muffins. They are so good. The recipe doesn't make more than a dozen, even with my history of having more batter than prepared muffin cups. As the strawberries have to sit in sugar to make syrup, I just got them going and had breakfast. The pancake was sliced into quarters, covered with warmed applesauce and I ate up the very last of the bacon I had fried up a few weeks back. Add tea and milk to take my pill and the whole thing was ready in 30 minutes. There was extra pancake which I brought to work for lunch. The muffins aren't going to make it into Wednesday, I'm afraid. This munchieness side effect of Prednisone has me trying to avoid the kitchen. "Oh look, a muffin!" my brain hollers as I come in for more tea. As good as homemade muffins are, it's not calorie conscious if you eat half the batch in one day.